I’ve been a handgun enthusiast for a little over a decade now, and I love everything about handguns. I love older pistol designs and all modern designs the same way. I have my preferences as far as handguns designs, i.e. I like hammer-fired handguns better than striker-fired ones, I like handguns with an all-steel frame better than those with a polymer or an alloy frame, and I like 1911s and SA/DA magnum revolvers far more than I’d ever like any other handgun platform. Likewise for handgun calibers, not counting rounds I consider obscure but slowly gaining popularity (e.g. 10mm, .460 Rowland), I have a soft spot for both the .45 acp and the .357 magnum — which shouldn’t come as a surprise to anyone because like I said, I love 1911s and magnum revolvers. For me, as far as handgun calibers, these two being on the higher end of the ballistics performance spectrum, no other calibers come close. 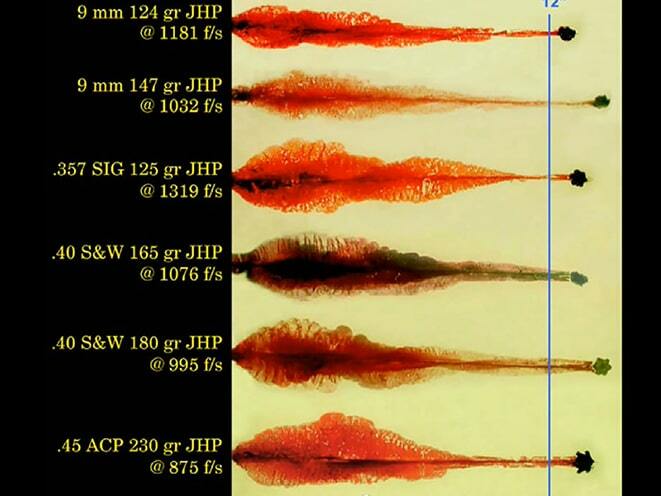 The .45 acp might be the slowest and heaviest of the “big three” semi-auto handgun calibers, but it makes the biggest holes in soft tissue targets when comparing FMJ vs. FMJ or JHP vs. JHP — its only downsides: terrible solid target penetration (slow and fat bullets have a hard time penetrating even entry level body armors) and lackluster ammo capacity in handguns chambered for it (the typical 1911 magazine can only fit seven to eight of these big fat cartridges). The .357 magnum on the other hand is the complete opposite of the .45 acp. A lighter bullet with a smaller cross sectional circumference propelled to velocities a couple hundred feet per second faster than the speed of sound, this handgun caliber is unrivaled when it comes to penetration, so much so that it will overpenetrate soft tissue targets — but that can easily be mitigated by using soft jacketed hollow point (SJHP) or jacketed soft point (JSP) bullets. Its only downside: lackluster ammo capacity. Typical small frame revolvers can only hold five rounds, medium frame revolvers can only hold six to seven, and large frame revolvers can only hold up to eight. Not saying that wheelguns are worse than semi-autos, if anything I feel safer knowing that I can store and access mine in a pinch, like in my car or nightstand. So as much as I hate to say it, my two favorite handgun calibers have the same Achilles’ heel: the handguns they’re chambered for can’t carry as many rounds as I’d like. 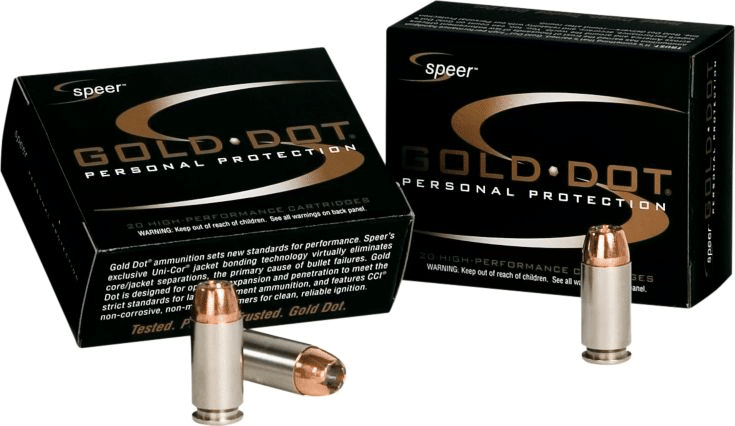 2 Which ammo do we pick for self defense? 3 So which one should you pick? Just because I said I prefer the two handgun calibers I mentioned above doesn’t mean I think the 9mm is no good. In fact, I like it a lot (just not nearly as much as I like the other two). I don’t buy into the whole .45 acp vs. 9mm debate, because I don’t see the point. Why do I have to choose one over the other when I can have both? 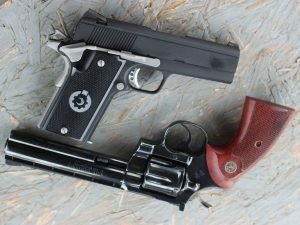 The 9mm will not create as big a hole as the .45 acp does, and it will never outrun a speeding .357 magnum bullet fired from a 4-inch-barrel revolver, so as far as ballistics, it will never come close to my two preferred handgun calibers. But it offers one thing neither of my preferred calibers offer: superb ammo capacity. 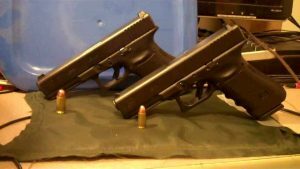 Case in point, a full-size Glock 17 can hold 17 rounds of 9mm in the mag, while a Glock 21 (which is about the same size as a Glock 17) can only hold 13 rounds of .45 acp. I wouldn’t bother comparing ammo capacities between shooting platforms for the .357 magnum and the 9mm, as I see no point in comparing revolvers to semi-autos. But if pushed to it, comparing single stack semi-autos, a single stack 1911 in 9mm can hold up to ten rounds, while both the long-defunct LAR Grizzly and the recently-revived Coonan 1911-style pistols chambered for the .357 magnum can only hold seven rounds. And don’t even get me started on modern 9mm handgun designs with wider frames that allow for double-stack magazines. I can go on all day. So the 9mm trumps both my preferred handgun calibers in the ammo capacity department. What about its downsides? Well, there are 9mm ammo extreme pressures loads (i.e. 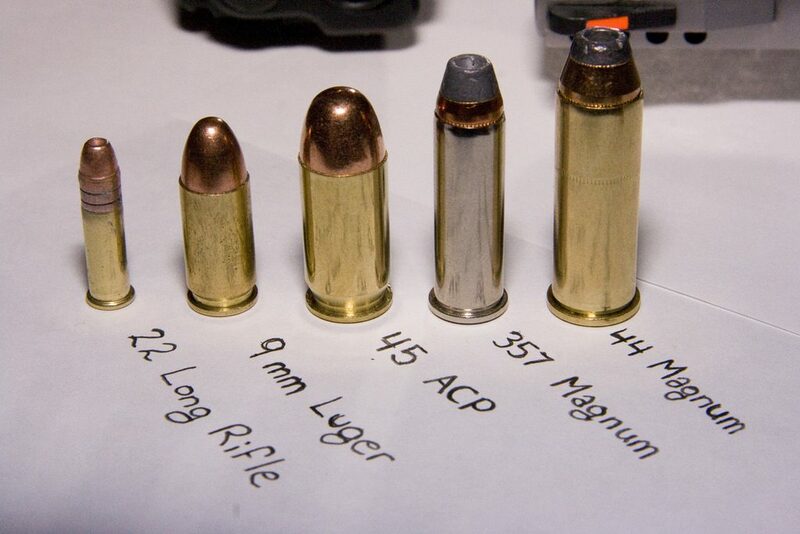 those with the +P+ designation) which, while a full 100 fps slower compared to entry level .357 magnum velocities, are up the same super sonic alley, making it vastly superior to the .45 acp whenever there’s need for more penetration. And with modern bullet designs such as expanding full metal jackets (EFMJs), jacketed hollow points (JHPs), etc., the lighter and faster 9mm can rival the slower and heavier .45 acp in the terms of wounding capabilities. With all the 9mm ammo choices on the market though, we’re presented with another problem. Which ammo do we pick for self defense? The perfect self defense load for handguns, regardless of the caliber, must provide penetration depths of 12 inches minimum and 18 inches maximum. At least these are the numbers the FBI go by. Fortunately for us, since the FBI already did the research, we can use this metric to help us determine which ammo to pick. But we’ll add a few more metrics of our own: muzzle energy, wounding capability (the bigger the permanent and temporary wound cavities, the better) and pricing. 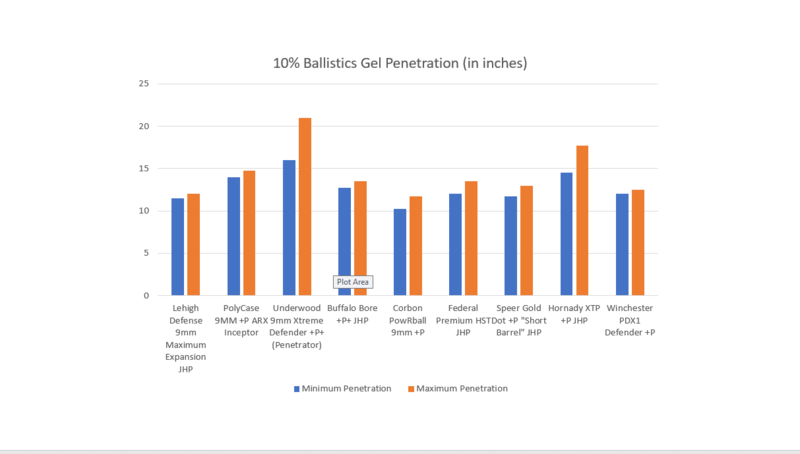 So to narrow down the ever-growing list of 9mm ammo options for self defense, we’ll be comparing offerings from different manufacturers based on the bullets’ ability to penetrate only within 12 to 18 inches (those that penetrate less than 12 or over 18 inches will have to be weeded out), how they perform in ballistics gel tests, and how much each costs. Info were gathered from several YouTube videos uploaded by tnoutdoors9, ShootingTheBull410 and ScubaOz, ammunition manufacturer websites, third party websites such as LuckyGunner and online gun forums. The research took a few days to make sure we only provide the most accurate data possible. To help our readers make sense of the table above, we’ve created a few graphs. The red bars on the bar graph above represent each bullet’s weight in grains. A heavier bullet penetrates barriers better, and when it hits a bone in the body, causes the bone to fracture and splinter. The bone fragments shooting in all directions in turn result in more tissue damage. 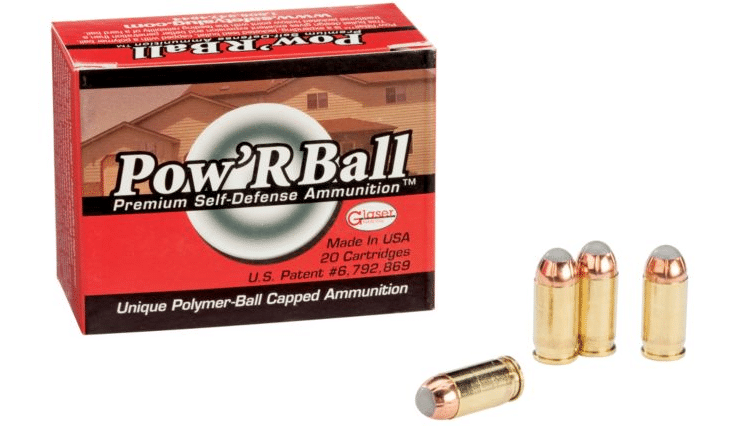 But the problem with heavier bullets (in 9mm cartridges at least) is they can be harder to push with the limited room the cartridge provides for powder — in simpler terms, a heavier bullet will move slower compared to a lighter bullet. 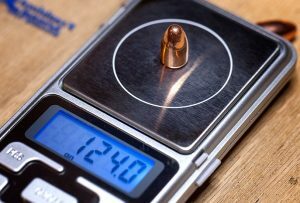 This is why the heaviest 9mm bullets only weigh 147 grains. In addition, heavier bullets tend to have more felt recoil. Five of the contenders, Federal Premium HST JHP, Speer Gold Dot +P “Short Barrel” JHP, Hornady XTP +P JHP, Winchester PDX1 Defender +P and Buffalo Bore +P+ JHP all weigh 124 grains. 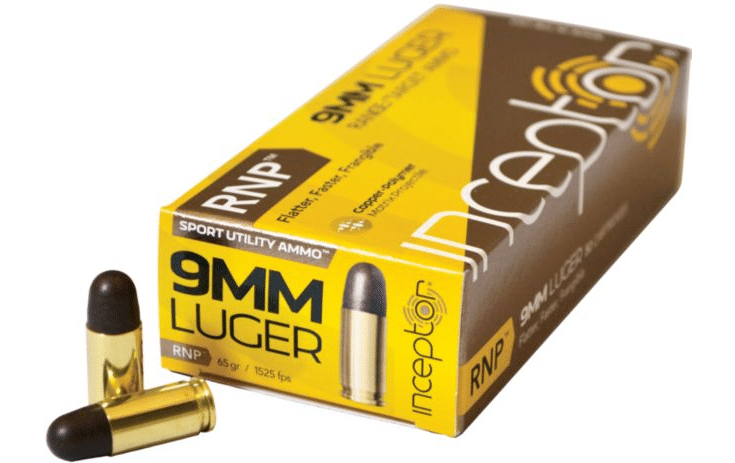 While these will have no problem breaking bones, these bullets will be significantly slower compared to the lighter and faster options like the PolyCase ARX Inceptor +P and the Underwood 9mm Xtreme Defender +P+. The green bars on the bar graph above represent each bullet’s velocity in feet per second. These are actual velocity figures when bullets are fired from a 4-inch barrel — not the velocity figures printed on the box of each of the brands. A higher velocity equates to more energy which results to better ballistic performance. But like weight, a higher velocity also has the same downside: more felt recoil. 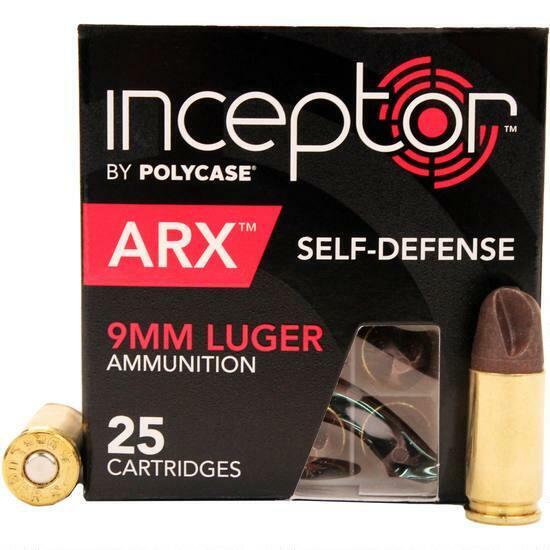 The fastest of all the bullets we gathered info on is PolyCase ARX Inceptor +P, which is understandably so, because it is also the lightest. Underwood 9mm Xtreme Defender +P+ is the second fastest, while Corbon PowRbal +P is the third. The yellow bars on the bar graph above represent each bullet’s energy in foot-pounds of force (ft.lbf) at the muzzle. Since we’re using actual velocity figures when bullets are fired from a 4-inch barrel, these are also the actual energy figures, not to be confused with those printed on bullet packaging. It’s a no-brainer that a higher muzzle energy equates to better performance. The consensus among firearms enthusiast is, when a high energy FMJ bullet hits a soft target, the energy is just wasted because the bullet won’t stop until it travels too far or it hits another target. But with designs such as modern day hollow points and fluted bullets, the energy is not wasted as the bullet can utilize it to cause more tissue destruction. So for the purposes of this analysis, since we’re not including FMJs, the higher muzzle energy a bullet has, the better it will be as a self defense option. 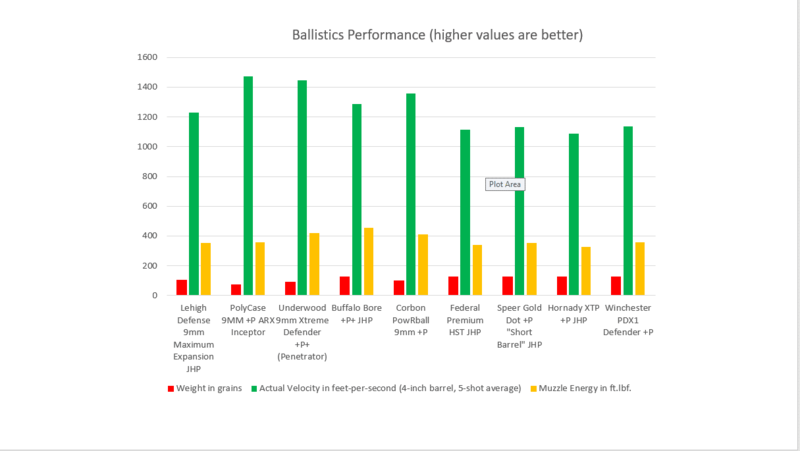 Among the bullets we analyzed, the one with the highest energy is the Bufallo Bore +P+ JHP. It’s among the heavier bullets but it has a 1,300 feet per second velocity, only 1 grain and 50fps short of typical entry level .357 magnum loads. In second place comes Underwood 9mm Xtreme Defender +P+, and Corbon PowRbal +P comes in at third. The graph below gives an idea how each of the bullets dump their energy in a soft target. 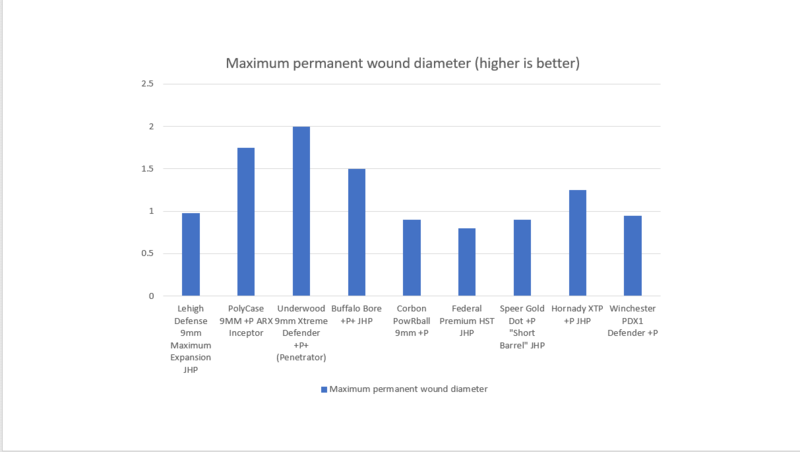 These results are in no way scientific because the type and measurement of wound cavities can be highly variable depending on a few factors such as the target’s stature and clothing, not to mention these results were taken by firing each bullet from a 4-inch barrel at a soft medium (10% ballistic gelatin – as dense as human flesh but behaves and reacts differently when hit by a speeding bullet) without accounting for bone hits and measuring only the widest visible disruption caused by the bullet (in inches). So as a disclaimer, take these results with a grain of salt. In a gunfight, it’s not the guy who uses the super awesome bullet design that wins, but the guy who can place well-aimed shots at the right time. Still, these results are a good indicator of how well a bullet would dump its energy in human tissue. Assuming you do your job, the bullet that will give you the best chances of incapacitating your bad guy quickly is Underwood’s Xtreme Defender +P+. The PolyCase ARX Inceptor +P comes in as a close second, and the Buffalo Bore JHP +P+ comes in third. As we briefly touched upon, the FBI adheres to a specific standard for handgun bullet penetration. A bullet has to penetrate at least 12 inches minimum and only up to 18 inches maximum when fired in 10% ballistic gel. The 12-inch minimum is required to make sure that it will penetrate deep enough to cause damage, while the 18-inch maximum is required so that it will not overpenetrate to the point that innocent bystanders might get hit. The blue bars represent the minimum depth (measured in inches) of ballistic gel material each bullet penetrated, while the orange bar represents each bullet’s maximum penetration depth. Unlike the previous chart listing the somewhat variable terminal performance of each bullet (i.e. wounding capability), these penetration tests can be repeated by simply shooting each bullet in 10% bare ballistic gelatin. It is therefore scientific and reliable. When shopping for 9mm ammo that will penetrate enough to only cause damage in the bad guy and not cause any collateral damage, we think the Hornady XTP +P comes out on top, the PolyCase ARX Inceptor +P again comes as a close second, and the Buffalo Bore +P+ JHP again comes as a close third. Unfortunately we’ll have to weed out the only over-penetrating contender when considering this metric (i.e. if you’re sure you won’t have to shoot a bad guy through a solid barrier) — Underwood’s Xtreme Defender +P+. In several tests it has been shown to always penetrate a couple of inches over the FBI’s 18-inch penetration limit. And this means we’ll have to remove the under-penetrating bullets as well. Lehigh Defense Maximum Expansion JHP, Speer Gold Dot +P “Short Barrel” and Corbon PowRball +P all have to be taken out of the list. Of course, what’s the point in crunching all these numbers and determining that brand X is better than all the other brands when you don’t have enough moolah to buy it? All this Mathcraft is useless if your handgun’s mag is empty, yes? The chart below shows how the different offerings stack against each other so we know which ones are wallet-friendly. 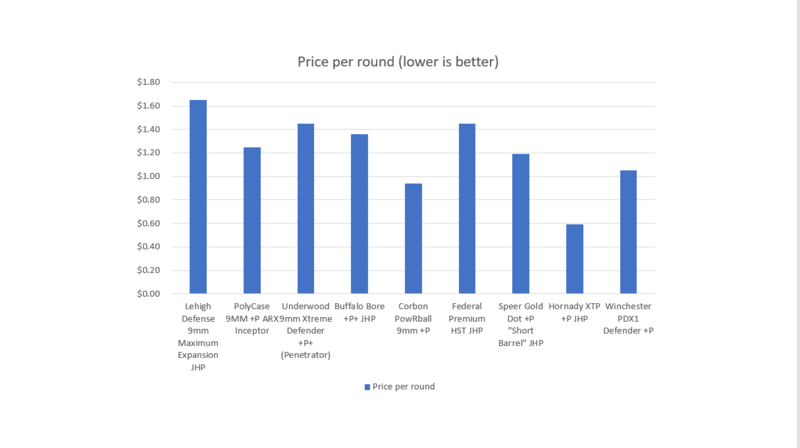 As can be quickly surmised from the chart, Hornady XTP +P is THE most affordable brand, while Corbon PowRball +P comes as a distant second and Winchester PDX1 Defender +P comes as an even more distant third. Yeah, it gets confusing when you have to factor in a bullet’s ballistic and terminal performance, its effectiveness to penetrate just enough to disembowel a bad guy, and its price. So, to make the comparison as fair to all contenders as possible, each bullet will be ranked from 1 to 9 depending on each of the metrics used, and all scores will be added up and divided by the number of metrics used. 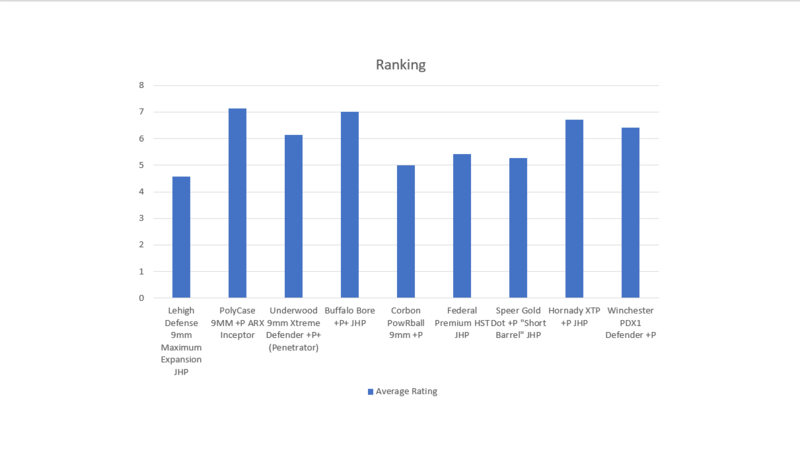 As far as I’m concerned, PolyCase ARX Inceptor +P, Buffalo Bore JHP +P+ and Hornady XTP JHP +P are tied for first place. Each bullet is designed differently — Polycase uses a more recent fluted design while Buffalo Bore and Hornady use classic jacketed hollow points. 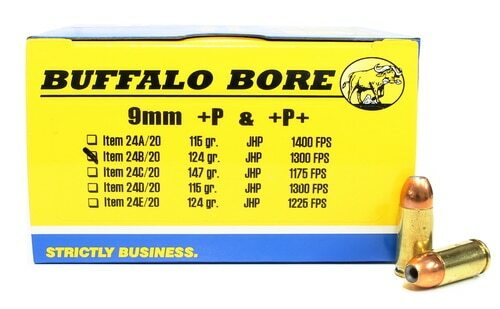 Of these three, I would choose the Buffalo Bore JHP +P+ simply because I just love Buffalo Bore. While they’re involved in a personal injury case with Glock and Cabela’s right now, I’ve always had a soft spot in my heart for their loads. 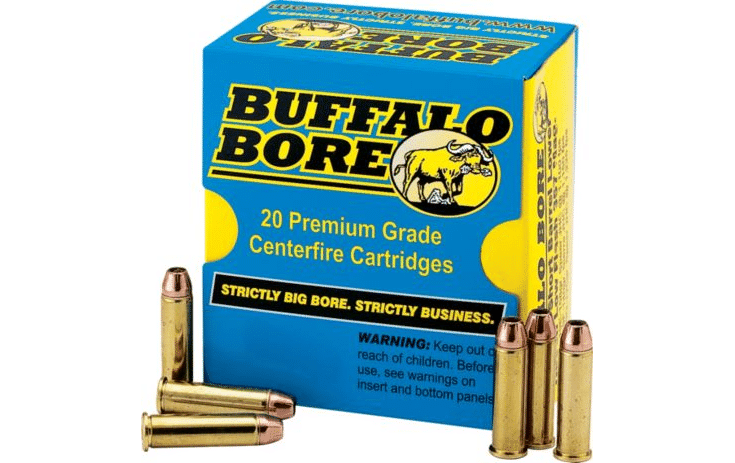 A small ammunition company (which makes them an underdog) known for offering some of the hottest factory loads on the market, Buffalo Bore has been around for a while (can’t find anything on them thru Google, the first time I heard about them was in 2008 when I read an article about the .460 Rowland) but I believe they were founded by Tim Sundles — a hunter who has a passion for super hot handloads. Like most simple folk, I like rooting for the underdog, and being the gun nut that I am, I just love hot loads. I’m not too sure about PolyCase. Their bullets have been shown in several tests to penetrate like an FMJ and wound like a JHP and those are made of polymer (blended with copper). I personally don’t care too much for things made of polymer, whether it’s handguns or bullets, but that’s just me. Then again Glock wouldn’t be the successful company they are now if all handgunners think the same way I do. If you want to try them out, no one’s stopping you. Feel free to share your experience with us by leaving a comment below. The real star of the show is Hornady‘s XTP +P JHP. It ticks all the boxes and is the cheapest of the bunch at just 59¢ a pop. 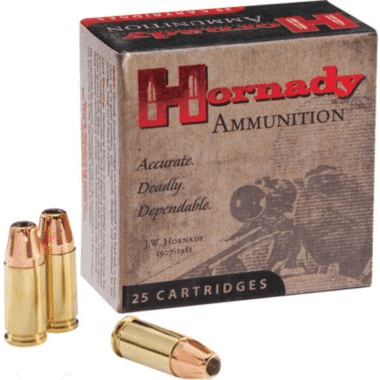 Everyone in the U.S. likes Hornady, I have yet to hear anyone complaining about their products. 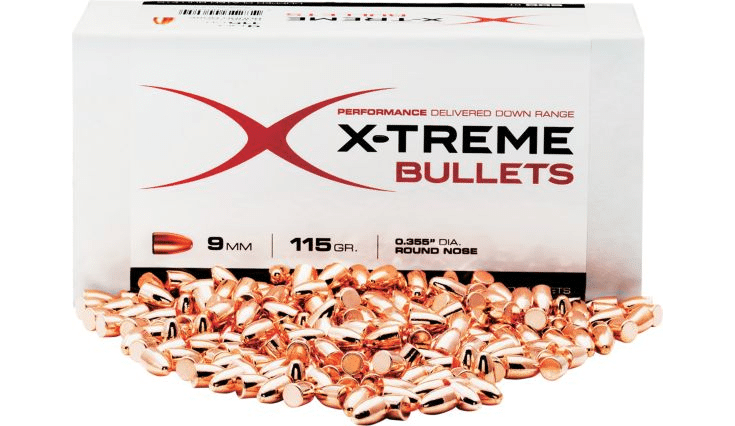 And these XTP bullets are literally everywhere, availability will never be an issue. Federal HSTs, Speer Gold Dots and Corbon PowRballs are some of the more established premium brands. I wouldn’t feel undergunned carrying any of these loads if they’re the only ones available thru my favorite gun dealer. My only real issue with these is being premium brands, they can be a bit too pricey. If you happen to have a Glock 19, you might want to know about a conversion option for it called .960 Rowland (I swear I’m not a fan of Johnny Rowland — okay maybe I am, just a little). It’s relatively new, I believe it only came out two years ago. But it’s supposed to mimic true .357 magnum revolver performance in Glock 19 handguns with just a barrel and recoil spring swap. 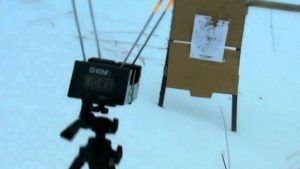 Johnny’s Impact load boasts of a 115-grain 9mm projectile with velocities of up to 1,600 fps from a 4.25-inch barrel. The 9mm as a handgun caliber is a great option for self defense, and there are literally a ton of good 9mm ammo out there. If you’re interested in a particular brand/design and they were not covered in this article, do your homework. Research on that load’s terminal ballistic performance and find out if they’re available in your area, as availability affects pricing. As with all else in life, choosing good 9mm ammo for self defense is never going to be easy as there are a lot of things to consider. But whatever you do, whether or not you end up ordering any of the ammo brands in this article, make sure you save some for practice shooting if only to familiarize yourself with how your handgun handles the loads — specifically, how accurate the bullets are and how they recoil. And never make the assumption that you can win every gunfight just because you have your mag loaded with some of the best ammo on the market. Always remember that in gunfights, shot placement is king. Great stuff here. Lots of info, thanks for the writeup. Fun article. The extreme defender link does not go to an Underwood products page on Cabelas (thought you might want to know). Also the article says “Underwood 9mm Xtreme Defender +P+ (Penetrator)” Underwood Extreme Defender and Underwood Extreme Penetrator are two different products where the Penetrator has tested on MAC as coming in about 21″. The Defender usually comes in about 17″. What’s really interesting is the similar testing results on the same product by both tnoutdoors and MAC. A side by side review like this article is awesome! Thanks. Michael, thanks for liking the article. It was the Penetrator bullet whose results we included here. How or why I ended up writing “Defender”, I can’t remember exactly, but my apologies if it caused any confusion. Great catch btw! I’ll get it fixed. Underwood’s Xtreme Defender indeed doesn’t penetrate as deep as their Xtreme Penetrator. The fluting on the Defender tapers a little deeper toward the bullet nose that the “cross” pattern on the nose looks thinner compared to that of the Penetrator’s cross pattern that looks thicker. G’day from New Zealand, Thank you for your well researched article. – regarding “OVER-PENETRATION” .. all things being equal (which they never are) perhaps a bullet that EXITS may perform by making two open wounds on the attacker and two areas of ‘exsanguination’. I would also be interested if you might include/add later the 9 mm RIP ammunition from G2 Systems as this is claimed to be most effective in your type of tests. Hi Martin. Thanks for reading through the article. Regarding what you said, “perhaps a bullet that EXITS may perform by making two open wounds on the attacker and two areas of ‘exsanguination’” — I agree with you on this. Two channels from which blood comes out means faster blood loss and is almost a guarantee that the bad guy is incapacitated immediately. There is nothing more preferable. The problem lies in bystanders potentially getting hit — and the defender potentially getting sued, not to mention bouts of guilt upon seeing their loved ones in pain. So yeah, I’d rather use a bullet design with controlled penetration. As for the RIP, I’ve heard of it but decided not to include it in the tests. I’ve seen a lot of videos and reviews from gun forum users who actually tried it — the RIP seems all hype. Had I included it in the tests, it wouldn’t have made top 5 because of its poor terminal performance and high cost (cheapest is ~$1.80 per round which would have made it the most expensive ammo on this list). i would still use the underwood as it over penetrated but only by 2-3 inches. if in fact it did go all the way through, how much energy do you really think it would have being that it was 2-3 inches?? 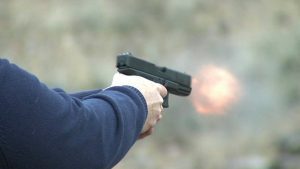 If the courts in New Zealand are anything like ours, NEVER use handloaded ammo OR ammo with sinister/malacious-sounding names or appearance, like the RIP, Devastators, Zombie Apocalypse or anything that a prosecutor, etc., would use to convince a jury that you’re a particularly blood-thirsty individual that out looking for an excuse to kill someone. Also, unless you live in and never stray from “the middle of nowhere,” over-penetration is NOT your friend and those that were downrange of your still-travelling bullet (or their families) will own you. 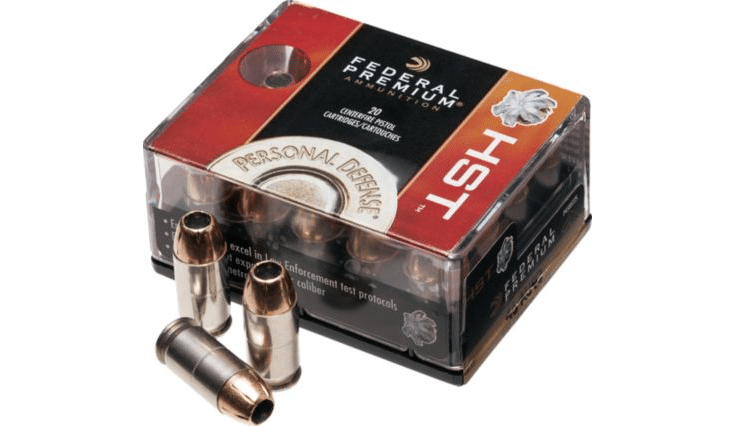 HST-124&147 gr rounds are good performers as well as Glaser. Great article! Extremely helpful. Thanks. IMHO, I think the PDX1 is far superior than all of the rest.